Russian Foreign Ministry has called it "dangerous stoking of misinformation"
The Russian Foreign Ministry has called London's claims that Moscow is undermining international efforts to stop the civil war in Syria "dangerous stoking of misinformation." Russian Foreign Minister Sergei Lavrov has described UK Foreign Secretary Philip Hammond's remarks alleging Russia's negative role in the Syrian conflict as unfounded. "We are used to these unfounded statements. It is characteristic not only of the Syrian topic, but our Western partners also prefer commenting on other acute global policy issues in a way that no one would be able to see any facts in them [the comments] because, if truth be told, no one is able to present any facts to us," Lavrov told reporters in Abu Dhabi on Feb. 2. “The Russians say let’s talk, and then they talk and they talk and they talk. The problem with the Russians is while they are talking they are bombing, and they are supporting Assad,” Hammond said at the Zaatari refugee camp in Jordan, near the border with Syria. "Hammond has not voiced any specific complaints [during personal meetings] because he is unable to voice them. 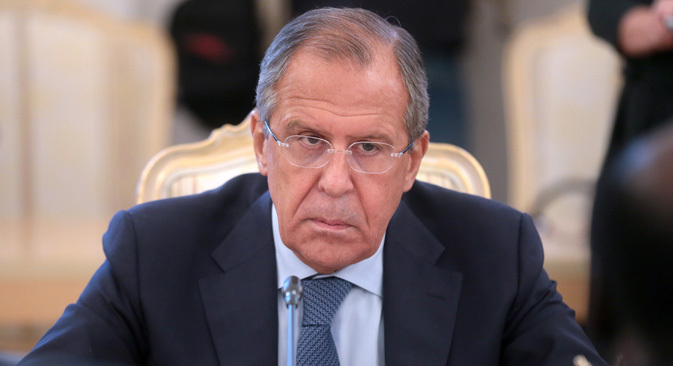 Probably, they [in London] want now that no one forgets them as participants in certain processes linked with the settlement of the crisis in the Middle East," said Sergei Lavrov. On the contrary, the Russian air operation in Syria has proved its effectiveness, he added.